French Foreign Minister Laurent Fabius has demanded that Egypt’s ousted President Mohamed Morsi be released, and criticised the unrest in Cairo. 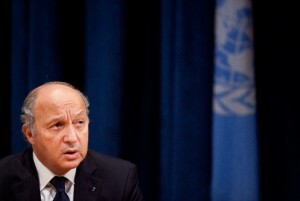 “We condemn the violence…We call for dialogue and for the release of President Morsi,” Laurent Fabius told reporters in Paris on Tuesday. More than 150 people have been killed in violence in Egypt since the country’s army overthrew the Muslim Brotherhood government on July 3. On Tuesday, the European Union’s foreign policy chief Catherine Ashton met deposed President Mohamed Morsi at an undisclosed location where he is being held by the Egyptian army. “I’ve tried to make sure that his family knows he is well,” Ashton said in remarks carried by Reuters. Interim Vice President Mohamed ElBaradei has said the former president cannot be part of future negotiations. Morsi is being investigated on accusations including murder, stemming from a 2011 jail break when he escaped detention during protests against Hosni Mubarak.